I'm excited to share these journal writing ideas with you. I've developed a love for writing...to myself! It's become a daily practice of personal connection, alignment and happiness for me. Here you'll find insights into to how to create and use a journal to add more joy to your life and well being. I'll also share a review of an online journal tool, journal writing ideas and the best journal writing prompts I've found. I believe that we are all wise and that we all have Inner Wisdom that we can use to guide our lives and actions. And, in order to access that Inner Wisdom, we have to find time to reflect, relax and quiet our busy minds and bodies. One way I take Daily Tune In Time is by writing in my journal. I've been writing in a journal since college, when one of my English teachers required it as part of our class assignments. Over the years journal writing has helped me remain conscious, and aware of, every aspect of my life. It helps me stay tuned into what I'm doing and why I'm doing it. My daily writing 'rituals' help me feel more balanced, tap creativity, remind me of my value, and Guide me toward daily actions that match my intentions. I write everyday, sometimes several times a day. I have notebooks in my office, in my car and all over my home. Awhile back I broke my left wrist (my writing hand) and strained my right wrist. I went roller skating and forgot how to fall. Ouch! (Note to self: Do not try to brace a fall, when roller skating.) The biggest upset around the whole experience was that I couldn't write in my journal every day! I felt a little lost. Then I found this amazing online tool: The Journal, an online Journal chock-full of journal writing ideas, journal writing prompts and so much more. Using it almost made the pain of having a broken wrist and a cast bearable! 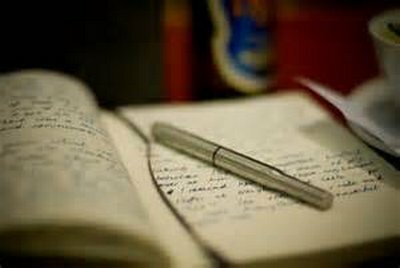 I could also see how to could help so many others get into the habit of daily journal writing, so that others could gain some of the same benefits I've experienced. Decide and commit to write in your journal for 30 days. Making this time commitment will help you get momentum started and give you enough time to experience the benefits. Make access to your journal(s) easy. If you're on the computer a lot during the day consider software like The Journal. Make writing accessible and easy so that you can write wherever you are - in the car, the train or in the office. Keep your journal private. Part of journaling is getting comfortable with your own self expression and not judging yourself. Keeping it private will help you let loose and be you. Trust what you write. This, to me, is one of the best journal writing ideas and insights - because journaling is about touching base with your Inner Wisdom and Talent. Let what wants to express, flow. This is a powerful exercise for learning how to trust and follow your instincts and knowing. Once you've been writing for 30 days, I believe you'll be hooked. I love The Journal, not only because it's on the computer, but because it has so many journal writing ideas that can help you make journal writing a habit. The Journal software has a free 45 day trial download link that allows you to begin journaling immediately. The Journal has a basic package, plus add-on tools. As early as 1965, psychologist Ira Progoff and his colleagues began seeing the value of personal journals in enhancing growth and learning. Progoff believed what he called an “intensive journal process” could “draw each person’s life toward wholeness at its own tempo." It systematically evokes and strengthens the inner capacities of persons by working from a non-medical vantage point and proceeding without analytic or diagnostic categories” . The NoteBook Tab is neat. I used it to organize ideas - which in my paper notebook are not very organized. The Journal made it easy for me to catalog and keep track of different projects and ideas. The online timer is great. I click on it and write for whatever amount of time I select. This keeps me focused and helps me stay with my writing so I don't get distracted. The Writing Templates are one of the best journal writing ideas I've ever seen. The one click writing templates help guide and prompt your writing. You can also easily create your own - templates, which I did. Two of the templates that I really like is the Food Journal and the Exercise Log. One click and the log is on your diary page for that day, making it easy to track what you want to track. Cool. The numerous Writing Prompt Templates to help build writing skills and to stretch your mind. Here are two examples. Example 1 - Creative Writing Prompt: Write for 20 minutes using the following as your starter: "Roosevelt buried the shoe in the back yard, then took off." Example 2 - Journaling Prompt: What type of art or culture moves you--or inspires you--the most? What is it about that type of art that draws you in? The Devotional Prompt Templates are cool - helping you keep and review your reflections about your God. They have enough prompts to keep you writing for 60 to 90 days! There are twenty Personal Growth and Development Prompt Templates (from well-known professional blogger Steve Pavlina).This tool provides powerful journal writing ideas for developing more self awareness and self direction, helping you study and uncover your ideas, insights and wisdom in the areas of: Success, Self Assessment, Goals and Purpose, Productivity, Problem Solving and Relationships. There's a MemoryGrabber Prompt/Template to provide journal writing ideas and insights to help you write your autobiography or to help you help someone else, perhapsan aging relative, develop their autobiography. This tool also has a feature that exports what you create to your blog. There's so much more to this tool that I am still discovering, and that's why I decided to become an affiliate for this product. It's my hope that more people will find the joy and connection I've found in journal writing, by using it. You can download a 45 day free trial - so you can try it out and test it. It's my hope that you get hooked on journal writing through the use of all the journal writing ideas found in this tool. Bottom line - if you feel drawn to writing, connecting with more of your Inner Wisdom and all of the benefits of writing, I believeThe Journal will be a great facilitator for you. Blessings to you on your journey! Click here to find out more about The Journal. "It is necessary to write, if the days are not to slip emptily by. How else, indeed, to clap the net over the butterfly of the moment? For the moment passes, it is forgotten; the mood is gone; life itself is gone. That is where the writer scores over his fellows: he catches the changes of his mind on the hop."